Features more than 20,000 alloy designations, including a complete listing of UNS designations for nonferrous alloys and comprehensive treatment of European and Japanese standards. It covers more countries, more alloys, and more standards than previous editions, while keeping obsolete designations for those persons trying to duplicate equipment from old documents. This comprehensive volume is well-indexed with easy-to-use cross references that make short work of looking up equivalents for a material specification or designation. It provides valuable composition tables that allow you to compare similar alloys. Tensile properties and product forms are provided when available. This book is organized by material group or class such as aluminum, copper, lead, magnesium, nickel, tin, titanium, and zinc. Each is further subdivided into groups, then finally into individual alloys. It's a must for metallurgists in design and manufacturing, materials producing companies, distributors and purchasing agents for metallic alloys, design and environmental engineers, academic and institutional libraries, and information centers. If you work in the international marketplace, it's especially ideal for identifying foreign specifications, finding similar alloys and verifying compositional limits. 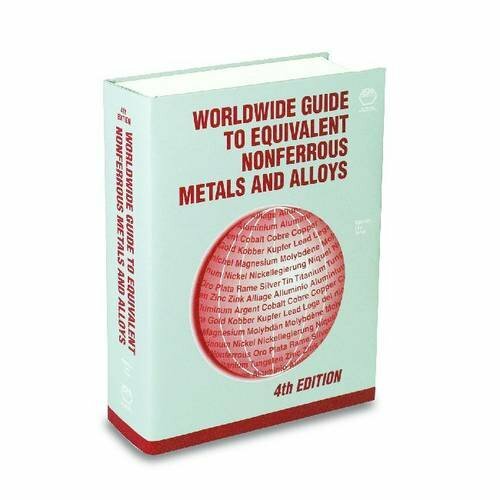 An excellent companion volume to the Worldwide Guide to Equivalent Irons and Steels, 5th Edition, this valuable reference book gives you the same complete coverage and identical format for nonferrous metals and alloys.